Up to the sorta half way point and I'll continue watching it why? cause I enjoy it. I won't get into too much since its season 2 and most the details are similar to season 1. Story: Things have certainly gotten better, we finally getting some more variety in the story. The darker tone along with mysteries popping up or resurfacing mysteries gives more reason to keep your interests into the anime without you getting bored with just yokai stories every episode. Show is doing a great job at wanting me to think and theorize before the next episode. Art: The art-style is different, it seems more crisper while season 1 had more brighter shades and looking soft. Sound: Some the tracks sound really good as expected. Looking forward to see new tracks hopefully. They did a good job with characters voices to fit the scenes. Characters: Not much to write about here, basically like season 1; good characters for the same reason I written in my season 1 review. Enjoyment: Not sure if its more enjoyable because of the mix between the fun jokes and dark moments or the jokes just gotten better. I found myself really enjoying the change of pace and the new tones. 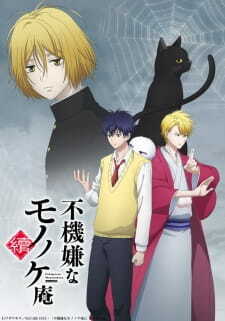 Overall: I feel Tsuzuki is on the right path, Season 1 mistake in my opinion was they never touched on the powers Abeno and Ashiya used which left me and watchers hanging and I feel Tsuzuki is starting to finally get close to explaining things. The change from just comedy to focusing more on the drama with darker tones was a refreshing feeling to the palate. I have high hopes for this season. Don't let me down.